After two and a half months, it’s finally here: the next chapter of DC’s major event for the year. The wait wouldn’t have been so bad if the tie-in one-shots, Submit, Superman: Beyond, Resist and Rage of the Red Lanterns had come out between issues #3 and #4, as originally described — or if Rogues Revenge and Legion of Three Worlds had stayed on schedule. As it is, there’s been a generally sense of frustration associated with the series. So the question is: Is this issue worth the wait? Is it good enough to overshadow the real-world context? All the threads being set up through the first three issues come together. We see what the villains have been planning. For the most part, they’ve already achieved what they set out to do: dominate the Earth. They only need to wipe out the few pockets of resistance, and achieve one more goal: the reincarnation of Darkseid himself. Admittedly it covers some of the same ground as the “Rock of Ages” storyline from Grant Morrison’s run on JLA, but Final Crisis is emotionally more devastating than Rock of Ages. It takes place now, with characters and a world as we’re used to seeing them, not in some ten-years-distant future. (Though come to think of it, “Rock of Ages” came out about ten years ago, didn’t it?) And knowing how quickly the world was transformed makes it even worse. There are a few things that don’t quite work. A lot of the dialogue, particularly the technobabble, the speechifying, and the scene in which two Flashes pause to catch their bearings, is stilted or doesn’t quite make sense. As with the first few issues, transitions between scenes are often abrupt. And some story elements just aren’t given enough space to develop. Much of the issue is devoted to characterization, which personally I don’t mind, but I know many readers are in it for the action and battles, and there’s only a few pages of actual fighting. One more thing that didn’t ring true: the amount of time Dan Turpin resisted becoming Darkseid’s new host. I realize they’re trying to make a point out of it, but resisting Darkseid, one of the most determined, powerful, evil beings in the universe, who can justifiably be called a god, for a whole month? That’s a little hard to swallow. Given how many threads are competing for panel time, it’s surprising how prevalent the theme of family appears. The resistance cell at the Hall of Justice includes the wives of two Flashes, as well as Wally and Linda’s children. It also includes married couple Green Arrow and Black Canary (though a new reader could be excused for missing that until near the end of that sequence). The Tattooed Man is there because Black Lightning helped his family. And once Wally and Barry catch their breath, what do they do? Wally frets about his wife and kids. Barry tells him they’re okay (how does he know?) and heads straight for Iris. The double-page spread of what happened to the Blüdhaven strike force. Green Arrow, staying behind to prevent the hordes from following his wife and their allies to their next bolt-hole, is forcibly converted to Anti-Life. Wally & Linda’s daughter Iris asks when everything will go back to normal. Barry and Iris, reunited at last. I didn’t even want Barry to return, but I start tearing up just thinking about that scene. That last scene also sets up some interesting questions. Judging by the lightning effects, it’s probably not the kiss of true love that awakens Iris from her Anti-Life-Equation catatonia. With Libra’s remarks in Rogues’ Revenge about the Flashes being the key to the crisis, one has to wonder: is the speed force the way to counteract the Anti-Life Equation? 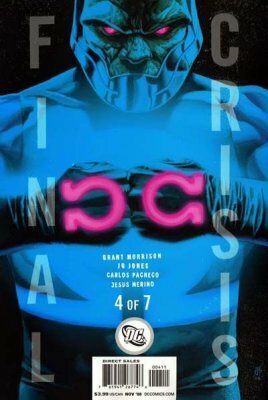 This entry was posted in Reviews and tagged Final Crisis, Grant Morrison on October 22, 2008 by Kelson. Thanks for the review. I’m not willing to do much more than peruse the series – not after what I saw in the beginning – but I remain curious about the circumstances of Barry’s return (which seems much more explicit than I’d last heard). Maybe I’ll play catch-up, at some point. Hm. That Barry/Iris moment made you tear up? Now I’m doubly curious. .-= West’s latest blog post: Early Voting =-. You didn’t want Barry to return? That’s a surprise. Guess you’re a young’un then. i loved the Barry/Iris “I’m home, honey. sorry I’m late.” moment!!! also, what’s the dealio with Barry’s eye turning Libra brand Orange on the bottom of that first page where he’s back? maybe Barry Allen is Libra? a double-crossing/inside man type of thing? i’m confused on that particular panel and can’t wait until Nov 26th!